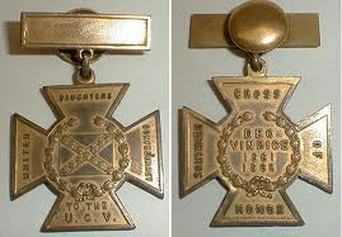 The Southern Cross on Honor was bestowed upon over 78,000 Confederate Veterans. To learn more about the cross, click on the link below. We are proud descendants of men and women who would not compromise what they felt was right and in line with the intentions of our Founding Fathers. We honor them by listing their service. As part of our Memorial objective, we have created online cemeteries for our ancestors, deceased chapter members, and those served the CSA and are buried in Wakulla County. These are a work in progress. Click on the links below to access. Yall check back often for updates. * If you locate a veteran who does not have a proper headstone marking his service, click here to apply to the VA for one. Adams, Brigadier General John Adams. Adams was a West Point graduate who resigned his commission upon the Secession. He was in Gen. J.E. Johnston's campaign for the relief of Vicksburg, in the fighting around Jackson, Miss., and afterward served under Polk in that State. He marched with Polk all the way to join the Army of the Tennessee. He served with distinction in the various battles of the campaign from Dalton to Atlanta, he and his gallant brigade winning fresh laurels in the fierce battles around the “Gate City. ” After the fall of Atlanta, when Hood set out from Palmetto for his march into north Georgia in the gallant effort to force Sherman to return northward, Adams’ brigade was much of the time in advance, doing splendid service, and at Dalton capturing many prisoners. It was the fate of General Adams, as it was of his friend and classmate at West Point, Gen. Geo. E. Pickett, to reach the height of his fame leading his men in a brilliant and desperate, but unsuccessful, charge. But he did not come off so well as Pickett; for in the terrific assault at Franklin, Adams lost his life. FOR MORE INFORMATION, CLICK HERE. Butler, John - Company F, 6th Regiment, Florida Infantry. 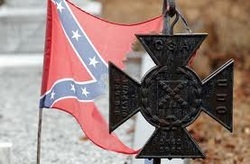 The 6th Regiment, Florida Infantry (Confederate) (section) Organized at Chattahoochee, Florida, in March 17, 1862, and ended the war in North Carolina. John was a single man, aged 21, when he enlisted. The 6th Regiment mobilized toward Knoxville, Tennessee on June 13, 1862, first by steamboat to Columbus, GA and then by train. However, John left the Apalaicola Arsenal in Chattahoochee on June 30th due to being sick. In August, 1862, he was on detailed service at Charleston and back in Tennessee. It was believed he was drove supplies for the Cause. He was hospitalized and then fined $48.86 for losing a gun and accouterements. He received $9.90 commutations for rations while he was on furlough and disabled. His widow's pension application indicates he was honorably discharged from "hospital" in 1865. He returned to Jackson County and ran a mill with his father in law Ennis Pippen in the area now known as Clarkesville which is in current Calhoun County, FL. Carraway, Labron - On 1 March 1863 at Camp Johnston, Florida, he enlisted in Company G, 2nd Regiment, Florida Cavalry. He was captured in Wakulla County in October 1864 and paroled in Baldwin, East Florida on 17 May 1865. According to the WPA Veteran’s Grave Registration of 1940-1941, Labron died in 1895 and is buried in Arran Cemetery, Wakulla County, FL. Chitwood, Private William C. enlisted in Co. D, 4th Confederate Infantry as a Private on 14 Sep 1861 at Montgomery, AL at the age of 28. He was present on Company Muster Roll for Sep – Oct 1861. He was captured at Tiptonville, TN on 8 Apr 1862 and died at Camp Randall, Madison, WI on 29 or 31 May 1862. Cook, William Sanford enlisted in Co K 20th Reg. NC Infantry Volunteers on 24 April 1861 at Columbus Co. NC. He was present on the company muster roll of August 31, 1861 and had pay due from enrollment to 31 Aug 1861. He traveled 80 miles to rendezvous and was on the company muster roll of May 1861. His age 29, farmer, height 5 feet 8 ½ inches. He was mustered into service on June 18 1861 at Fort Caswell and was on furlough on Jul 13 1861. This company subsequently became Co K 20th Regt. NC Infantry State Troops by S.O. No 222 , A&LGO dated 14 Nov 1861. He was on list of men belonging to 20 Reg NC Troops employed on detached service and extra duty as a nurse in Hospital on April 1 at Richmond by the surgeon. He was on regimental return for the month of May 1862,he was a nurse in hospital at Fort Johnson. He was present on company muster roll for March 1862 whose enlistment was extended for two years. Davis, Private Levi enlisted in Co., I 5th Reg. FL Infantry on 14 Mar 1862 and was discharged June 1862 for disability. Dorsey, John Nelson - Company F, 7th Regiment, South Carolina Cavalry. Private Dorsey's regiment saw action at Petersburg Siege VA (JUN 1864 - APR 1865), New Market Heights (29 SEP 1864), Ropers' Farm (30 SEP 1864), Saylors Creek (6 April 1865) and were at Appomattox Court House. John Nelson was injured in Richmond and sent home on November 30, 1864. Harrison, Private Mathew James enlisted in Co I, 3rd GA Reserves on 16 Mar 1864 at Bainbridge, GA. He served until 16 May 1865 when he was released at Tallahassee, FL on signing the Oath of Loyalty to the US. He was 5ft 6in, had light hair, dark eyes, and dark complexion. for more details and to view maps. Collin's service record specifically shows he was on guard at the James Island bridge, SC during May and June 1864. According to an obituary, Collin fell from a fence in 1900 which infers this as cause of death. Kirkland, Judge Abram Lane was elected as one of two delegates to the Georgia Convention of 1861 for Emanuel County, he first voted against secession, however once secession was approved on January 19, 1861, he signed the Ordinance of Secession for the State of Georgia. His home was later burned in the winter of 1864 by Sherman’s men in retaliation it is supposed for him signing the secession order. Landrum, Jacob Turner b. 9/9/1842 Warren Co. GA; d. 8/27/1914 Citrus Co., buried in Hernando Co. Enlisted 7/19/1861 at Brooksville at a member of the THIRD FLORIDA INFANTRY,COMPANY C (Hernando County Wildcats). He was captured at night in Chattanooga 9/25/1863 and released on oath 6/7/1865 from Fort Delaware prison. He stood 5'8", dark hair & skin with grey eyes. Langston, Jesse - On 17 May 1861, Jesse enlisted at Newport, Wakulla County as a private in Company D, 3rd Regiment, Florida Infantry. On 14 March 1862, he transferred to Company I, 5th Regiment, Florida Infantry and was promoted to 4th Sergeant. Jesse wrote home often to his wife and the family saved his last four letters. In his last letter written from Virginia, he says, “Mary, we have cold and rainy weather here and we have to take it as it comes. We have no tents and we have to make tents of our blankets.” Jesse died on 9 November 1862 of pneumonia at the Florida Hospital in Richmond, Virginia. He is buried in the Soldiers Plot at Hollywood Cemetery in Richmond. Lawson, Private Albert Gallatin enlisted in Co C. 13th AL Partisan Rangers on 6 Sep 1862 at jasper, AL. This unit was consolidated into Co G, 56th Regt. AL Partisan Ranger in May 1863. He was wounded and furloughed home in Mar & Apr 1863, was paid on 24 Nov 1863 $172.00, no other records in his file. McKenzie, Sergeant William P. D. enlisted in Co D Manigault’s Batt. South Carolina volunteers on 4 Dec 1861 which was subsequently consolidated with Co. H 26th SC Infantry. He served throughout the war. He was captured on 1 Apr 1865 at southside RR and taken to city Point, VA and was released on Oath of Loyalty on 29 June 1865 at Point Lookout, MD. He had light complexion, dark brown hair, hazel eyes, and was 5ft 7 ¾ in tall. Buried McKenzie Cemetery, Sanborn, FL. McMillan, Captain Angus - Company K, 6th Florida Regiment - was in Battle of Chickamagua, Battle of Chattanooga, Battle of Atlanta, Battle of Murfreesboro, Battle of the Cedars, Battle of Franklin, and was taken prisoner at the Battle of Nashville on December 16, 1864 and held at Johnsons Island Prisoner of War Camp in Sandusky, Ohio until June, 1865. (see his page) Angus returned home, got married, and helped found Chipley, Florida. He was postmater in Chipley, donated land for the presbyterian church, and cared for a black man in his home (1900 census). Pippen, Ennis - Company I, 11th Regiment, Florida Infantry. The 11th Infantry Regiment was organized in June, 1864, by consolidating part of the 2nd and the 4th Florida Infantry Battalions. Many of the men were recruited in Hendry, Jackson, and Bradford counties. In April, 1865, it surrendered 4 offciers and 19 men. Ennis was 54 years old at his time of muster. Player, Colonel Samuel Thomas Before the War Between the States, Samuel practiced law in Irwinton, Georgia. He enlisted in the 49th Georgia Volunteer Infantry, which was organized on March 4, 1862 at Camp Davis which was located near Guyton, Georgia. The regiment consisted of companies from ten counties in central and south Georgia. He enlisted as a Captain in Company A from Wilkinson County, Georgia (also known as the Wilkinson County Invincibles) on March 4, 1862, was elected Major on September 9, 1862, promoted to Lieut. Col. May 8, 1863, and promoted to Colonel on June 9, 1863. Samuel fought at Gettysburg July 1-3, 1863. He was part of the Army of Northern Virginia, 3rd Army Corp, Pender's Division (Maj. Gen. William D. Pender) and fought under Thomas' Brigade (Brig. Gen. Edward L. Thomas). Samuel was elected to the Georgia House of Representatives so he resigned his commission on March 24, 1864. Porch, Private James Peter enlisted in Co. A, 3rd Battalion North Carolina Light Artillery on 30 Jun 1863 at Topsail Sound, NC by Capt. Ellis for the period of the War. He was present for the Company Muster Roll 30 Apr – 31 Oct 1863; Jan 1864 through December 1864. He was taken prisoner and paroled on 27 Apr 1865 near Greensboro, NC in accordance with the terms of a Military convention entered into on the 20th day of April 1865 between General Joseph E. Johnson, Commanding Confederate Army, and Major General W T Sherman, Commanding United States Army in NC. Raker, Private Thomas Jefferson enlisted in Co. C 5th Battalion FL Cavalry as a private on 27 Feb 1864 at Camp Randolph by Lt. Lanier. He was absent on the Company Muster Roll; however, he was sent to General Hospital Jun 20 1864, was without a horse from July 20 1864. Transferred from Co. G, 2nd FL Cav Regt. He signed the Oath of Allegiance to the US Government on May 12, 1865 at Tallahassee, FL. He was 5ft 7in, light hair, blue eyes, fair complexion. Revell, Private Steven Calvin was in Company I, 5th regiment, Florida Infantry, He enlisted April 29, 1862 at Camp Leon, Leon County, FL for a period of three years. His enlistment was under Lieutenant Kinleck. He worked as an attendant in the 2nd division, General Hospital, Howard’s Grove, Richmond, Virginia. On or about the 6th day of May 1865 he was captured and held as a prisoner at Newport News, Virginia until July 2, 1865. Taff, William T. On 20 Feb 1863, William enlisted in Company D, 10th Regiment, Florida Infantry at Alum Bluff, Liberty County, Florida. He mustered out on 1 January 1864 and returned home. William was shot and killed by L. C. Boykin who later married Sarah Welch Taff in 1866 and they had a son. It is unknown where William is buried in Liberty County. Truett, John enrolled in the 1st Florida Regimentin A.B. McLeod's Company in March 1862 and was killed in the Battle of Perryville, Kentucky on October 8, 1862. While in an engagement, he was shot in the head and killed instantly. The Battle of Perryville was the largest battle fought in the State of Kentucky. Vause, Tom Evander, The War Between the States began and Tom’s three older brothers went off to fight for Southern independence. On 1 June 1864, Tom enlisted at Madison, Florida in Company K, 7th Regiment, Florida Infantry. His 1904 Application for Pension says he was captured after the fight at Nashville, Tennessee and paroled after the war. Willis, John Washington was in Capt Gamble’s Home Guard unit and fought at the Battle of Natural Bridge. He enlisted in 1864 and was honorably discharged at Tallahassee, FL in May or June of 1865. He died 1 May 1910 in Wakulla Co., FL and he and his wife Ellender are buried in Oak Park Cemetery in Wakulla Co.
Wilson, Haskett - On 8 May 1861, Wilson enlisted at Perquimans County in Company I, 17th Regiment, North Carolina Infantry.